Up to 25% OFF!!! Sugar Beach Resort Ground Floor Ocean Front Condo!! Other condo highlights include central air conditioning, free WiFi, full kitchen, and an in-unit washer/dryer. The bed is a queen sized bed. This condo has a max occupancy of 2 guests. 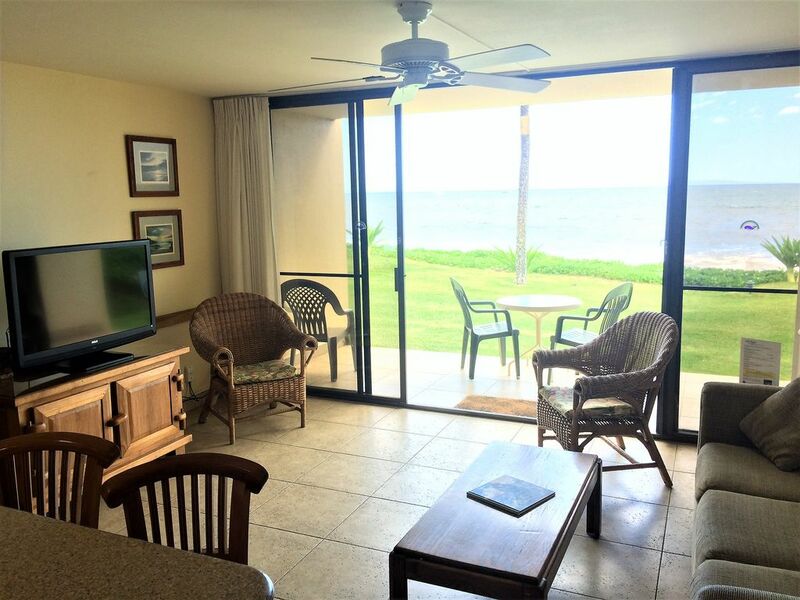 Condominium Rentals Hawaii has been managing vacation rentals on Maui and Kauai for over 30 years. We service thousands of guests each year and assure that they have memorable stays while in Hawaii! Great unit, except the bed was TERRIBLE. Property is great, access to beach was awesome (mere steps! ), living room and kitchen had everything we needed. Unfortunately the bathroom needed some maintenance, ex. Bath light was burned out, shower ventilation cover had screws pulled out which we found in the corner of the shower corner and hadn’t been cleaned properly..... and the Bed was so hard, neither my husband nor I slept beyond a basic snooze for 4 nights. We would both wake up with arms and legs having gone numb, and very sore backs upon getting up in the morning. I would highly advise replacing the mattress in this unit. It basically ruined our trip, and didn’t make for an enjoyable evening knowing bed time was nearing. I’m generally not this harsh on reviews, I have travelled significantly around the world, and had many instances where it was uncomfortable and not ideal, but I really expected better on this one. This unit is a ground floor, end unit at Sugar Beach Resort so it is lierally steps from the beach. It is certainly adequate as far as furnishings are concerned. It could use a new kitchen faucet (or repair that one). It isn’t working properly. My only real complaint it you can call it that is there were no throw rugs on lanai or inside the lanai to wipe your feet on when coming inside. Because this is a ground floor unit, this is really needed. I was going to be there for almost a month so I went and bought a couple of really cheap ones at Wal-Mart!! Other than that it had what was needed. I enjoyed staying there and would definitely rent again if available!! Mahalo for your review and long stay! Glad to hear you had a great visit. We will take a look at the sink to see if everything is working as it should. Mahalo! We had an outstanding time at this location. Was our 7th trip to Maui in the last four years to visit family and this was so far the best place we have stayed. Loved the location and the resort was great. Being right next to the beach on the ground floor was outstanding. Since we have done most of the tourist type things on Maui, this was a great place to just relax. We loved this condo. It wasn’t fancy but was very comfortable. Loved the ground floor - we could walk right out to the beach, the water was only about 20 yards away from our lanai. We could see the ocean from our lanai. Beautiful sunsets. Well supplied kitchen and bathroom. Chairs, boogie board, tatami mats. This is an end unit and it was very quiet. The condo complex was great - easy parking right behind the unit. Great pool, bbqs, lawn with lawn chairs. This is in the northern part of Kihei, so it required a drive to get to restaurants and grocery, but there was a great bakery, shave ice, ABC store and farmers market within walking distance. This location was great for going to west, north, or central Maui. Loved it! Mahalo for your review. Glad to hear you found it comfortable and in a great location. We hope to see you back again soon! Cancellation Policy: If you cancel 61+ days before your arrival date, you will receive a full refund. If you cancel 60 days or less before your arrival date, you will receive no refund. Cancellation policy: Policy available by contacting manager when booking.